Editor’s note: This feature is provided courtesy of the Institute for Urban Design, New York City, Ann Ferebee, Director. For information on the Institute, membership, and its upcoming fall 2005 programs, please contact her at 212-353-2380, fax 212-353-2381, e-mail Aferebee@aol.com. Shaping high density residential environments is the most important issue before urban designers in North America today. As the urban consequences of permanently higher energy costs sets in, and as the benefits to urbanity of properly-managed high density living become ever more evident, new debates are emerging, while old debates are falling away. The debate that is falling away – quicker than one might have imagined, given its prominence in the popular and professional press over the past 15 years – is that revival of late 19th century suburban ideals packaged as The New Urbanism. Better layouts for walkable town hubs, an ongoing taste for the neo-classical, moderately-, even nominally-increased housing densities – the shelf of curatives it offers misses the real malaises of the contemporary city. It is ever more evident that “The Old Suburbanism” is only a shuffling of deck chairs on top of our Titanic urban issues. The new debate about cities centers on portions of two cities, the first being one of the oldest metropolitan zones in North America, the other one of the newest. Lower Manhattan is currently the most dynamic and interesting portion of New York, now undergoing one of the periodic series of urban revivals it has experienced since its founding by Amsterdam burghers and Jewish refugees from Recife. The other site of intense scrutiny by urban designers these days is downtown Vancouver, invented overnight two and one half centuries later as a land promotion scheme by the Canadian Pacific Railway. The clearest evidence of the changing realities of city building is the fact that downtown Vancouver has recently eclipsed Manhattan as North America’s highest density residential area. But this may change again, as Downtown Manhattan is currently home to a high density housing boom, much of it sparked by loan guarantees and direct investment made available in the wake of the urban devastation of 9/11. The two cities have adopted quite different institutional and urban design strategies towards the same ends: the creation of livable, socially-mixed, high-density neighborhoods with high level amenities that co-exist happily with conventional downtown functions. And my title lies a bit; because it is not really “Vancouverism Versus Lower Manhattanism,” but “Vancouverism Plus Lower Manhattanism,” as there are ideas in both places that might well migrate elsewhere. A quick review of what sets Vancouver apart. Concocted instantly in the late 1870s as a land promotion scheme for the Canadian Pacific Railway, Vancouver is the continent’s youngest major city – younger than Seattle and Denver, even Phoenix and Calgary. 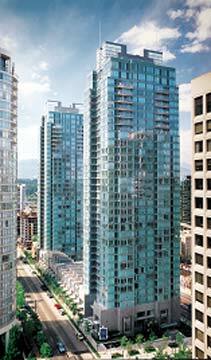 Always a place of innovation in urban planning and housing design, Vancouver has seen its downtown population double in the past 15 years. The continent’s youngest major city with its highest residential density? – iron rule number one of North American urbanism broken. Broken rule two is just as important. 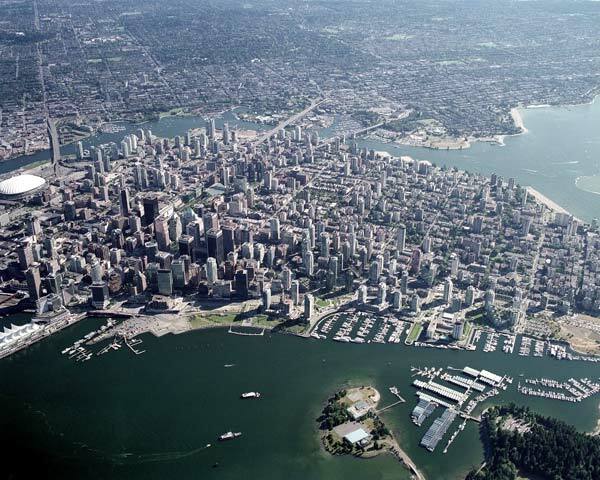 Vancouver is the only major city in North America without a single freeway within its boundaries. Citizen activism in the late 1960s saved Gastown and Chinatown by stopping a roadway with the Orwellian name of the “East Downtown Penetrator,” followed by significant investment in elevated rail public transit. Rule three is that Vancouver’s current planning decisions are almost entirely insulated from interference by city councilors and mayor. This does not mean unbridled power for planners (land use policy remains politically accountable), but it does allow for decisions in the long-term interest of the city to often prevail over the short-term needs of getting re-elected. Born of our geographic situation wedged between mountains and sea, Vancouver has had a historical legacy of relatively high-density living, taken to new heights by a political culture in which more people per block is thought to be a positive nearly as often as often as a negative. Rule four has to do with one of the urban forces most difficult to discuss: race. While having immigrant and non-white population ratios comparable to New York, Toronto, and Los Angeles, Vancouver has escaped many of the striations and frictions that come with neighborhoods sorted by ethnicity. The shame of our city is not a racial ghetto, but a chemical one: indeed, the Downtown Eastside is one of Vancouver’s most multi-cultural, multi-racial neighborhoods, one linked by a culture and economy of drug dependency. The Downtown Eastside’s tragedy may well have been exaggerated by urban planning policies that have concentrated social housing and front-line poverty agencies in this district as densely as condo towers are concentrated only six or 10 blocks to the west. Rule five has to do with the role that developers have in providing the social, cultural, and recreation infrastructure in new and renewed neighborhoods. For nearly 20 years, Vancouver has used a form of social bonus zoning, in which extra density in housing developments is granted in return for such public amenities as cultural facilities, parks, schools, and social housing. After resisting it at first, our development industry likes the current system, one where density is traded for a better public realm, because they find such investments increase the value of their projects. public amenity in its social bonus zoning by a tradition of the highest housing densities on the west coast. The near-downtown neighborhood of the West End had Canada’s highest residential densities by the 1960s, and an established development model of small floor plate, mid-rise towers (small plates because the size of land assemblies were limited due to public lanes running through all downtown blocks). The False Creek South developments later that decade established some of the other planning principles important to Vancouverism; a mix of income groups and modes of housing tenure in dense neighborhoods with significant investment in parks, sites for social housing, arts, and recreation facilities. When the North Shore of False Creek was developed in the late 1980s, these principles were applied at significantly higher densities, and in Hong Kong-inspired small plate high-rise towers, rather than the mid-rises constructed previously. In large part because the 240-acre site of the former EXPO 86 was acquired at a very low net cost by Hong Kong industrialist Li Ka Shing, significant public investments in the area were extracted from his Concord Pacific Developments. Parks, the Roundhouse (a neighborhood recreation and arts hub), public artworks, even an elementary school were all funded – in the main – by the developer. In the 1991 Downtown Plan that soon followed, the social bonus zoning system was codified, it having been established that Vancouverites – perhaps inspired by the wave of Hong Kongers and Taiwanese then arriving in the prospect of the return of the Crown Colony to China in 1997 – were not driven by typical North American squeamishness about increased housing densities. 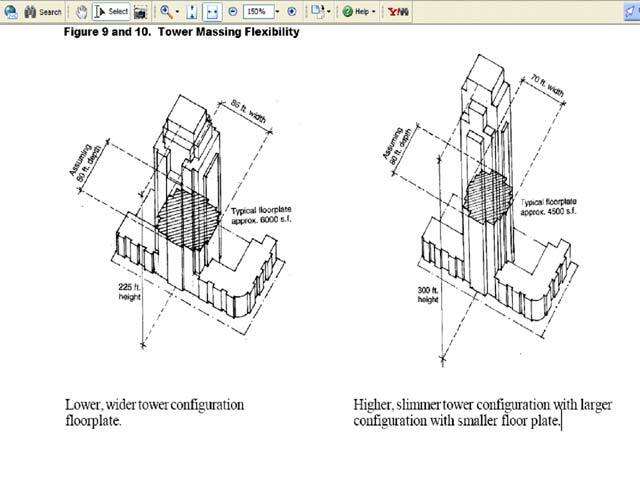 The same plan established the small plate high rise tower on townhouse base typology that is the architectural face of Vancouverism, along with the notion that developers, not taxpayers, would help pay for public amenities in new districts, raising the value of their constructions through a vibrant public realm. The same plan also re-zoned a huge portion of the downtown peninsula as “housing optional,” but which has since developed almost only as housing (more later on this worrisome current “de-downtownization” of Vancouver). Here is an example of how the social bonus system works in application. For a double tower on townhouse base project at Richards and Nelson Streets (in the Downtown South area almost entirely re-zoned in 1991 from low-density light industrial to high-density housing optional) that came to be called “The Mondrian,” Bosa Developments was granted a bonus of about four extra stories of condos in exchange for a significant public amenity, selected and managed by the City of Vancouver through a development agreement. This was raw space to be provided in perpetuity to the city, which in turn leased the space to the Contemporary Art Gallery, a highly regarded semi-public gallery analogous to the New Museum in Manhattan. The neighborhood lost a little sky and light, there are a few more deliveries and demands on local services, but the net effect is a lively cultural institution provided without capital cost to the public purse. Trading density for amenity is the Vancouver formula in a nutshell. The trouble with the Vancouver system is that it only works for high growth cities, where the economic returns from extra density permit the private sector to finance social benefits with extra constructions for which there is a guaranteed market. It also requires high degrees of European-style “statism” or more specifically, dirigism – planners determining the form of buildings and the appropriate public amenities. Most Vancouver architects resent the power exerted by the current downtown planning team, and the more planners intervene on visual and design issues, the worse the result – aesthetically most often, socially, sometimes. Thus Vancouver’s urban successes may well have come at the price of architectural quality, innovation, even standards of building finishes. Our best architects almost never get commissions downtown (these go instead to low fee production houses. Architect James Cheng’s designs – such as the Residences on Georgia (pictured) – are welcome exceptions to this pattern. Only now, as the last 10% of downtown tower sites are being developed, has architecture and quality of housing layout started to become a real factor in a real estate marketplace, heretofore shaped by condominium apartments as a generic commodity – like hog backs – ripe for speculation. This planner’s paradise – Downtown Vancouver – has exemplary urbanism, a lively social mix, and a high quality of life, all of which make it ever more attractive as a “resort” for fluid international capital seeking a temporary home and as a retirement zone for baby boomers, and much less attractive as a place to conduct business. Downtown Vancouver’s weaknesses (trading jobs for condos, taking third rate designs with sometimes questionable “social benefits”) may yet overpower its strengths (cosmopolitanism, dynamic social and ethnic mix, a glorious site). It is a surprising fact that redevelopment of the core areas of American cities is dependent to a much larger degree on federal government funding than in otherwise more social democratic Canada. The American model is one of redevelopment agencies, special tax relief zones, and direct public investment in urban regeneration. Money is flung at American urban problems in the form of bond financing and direct subsidies to private sector builders. Canadian urban redevelopment is much more intermediated, slower, and distributed through narrowly-defined public domain funds, such as the Vancouver Agreement – federal money which is investing in the city’s troubled Downtown Eastside. Especially over the past five years, Canada’s federal government has been investing far less per capita in cities than that of the United States. Moreover, Canadian constitutional arrangements mean that municipalities are unable to institute sales taxes and similar revenue generators, and cannot issue bonds, a key means used by American cities to raise capital for infrastructure. To generalize broadly but usefully, the key shaper of city building in Canada is city planning – understood as a Utopian technocratic art performed by public agencies. The key shaper of the American city is pragmatic funding programs – some of them direct investments, others less visible allocations of public money to private recipients, such as mortgage payment tax deductibility, a huge investment of public funds unknown in Canada and most other countries. These forces are evident in the story of New York Liberty Bonds, which have sparked the current boom in construction of rental housing in Lower Manhattan. These hastily devised economic development instruments were designed to deal with an immediate and unprecedented calamity – the aftermath of the 9/11 terrorist attacks, which were led by architect and graduate student in urban design Mohammed Atta (his thesis for a German university was about Islamic tradition versus modernity in the urban development of Aleppo, Syria). While Lower Manhattan has not been a significant residential neighborhood since the late 19th century, those apartments that remained there saw their occupancy rates plunge from 95% to 65% in the months after the attacks, according to Tracy Paurowski of the New York City Housing Development Corporation. The post 9/11 effect on retail businesses and office space occupancy was – if anything – even more devastating. For the southern tip of Manhattan, the United States Congress authorized $8 billion for New York Liberty Bonds. As constitutionally required, these funds were administered through the State of New York, half of the funds allocated to flow through city agencies. $1.6 billion of the bonds were reserved to foster “new multifamily rental housing” in Lower Manhattan. To put things in perspective, only 20% of Liberty Bonds are available for housing, and this total is less than the $2 billion made available, for example, for commercial projects outside of the “Liberty Zone” below Canal Street. Then there was the difficult issue of fostering affordable housing in Manhattan. There was a widespread sentiment that the new funding stream should create rental housing for those other than solely wealthy New Yorkers, but the nature of these bonds makes this goal difficult. The state and city agencies selected to administer the Liberty Bonds used different policies when contracting with developers for the $800 million each was allocated. For the New York State Housing Finance Agency, there was a requirement that at least 5% of units be permanently reserved and priced for New York families making no more than 150% of medium income – over $90,000 for a family of four. Evidently, this is an “only in New York” definition of affordability. To NYSHFA’s credit, these subsidized units are distributed around apartment buildings, ensuring that no floor or portion is stigmatized. On the other hand, the New York City Housing Development Corporation took a different strategy, which charged developers receiving Liberty Bonds to pay a 3% origination fee, which has to date generated a total of $15.3 million, used as 1% second mortgage loans that have generated 394 apartments, all in the outer boroughs where land and construction costs are lower. The first to benefit from NYCHDC Liberty Bond financing was a Battery Park North housing tower literally devastated by debris from 9/11 while still under construction. According to developer George Aridas of the Albanese Organization, Liberty Bond financing when no other money was flowing to Lower Manhattan revived what might have remained a contemporary ruin. 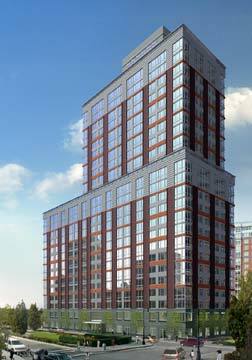 The result was named the Solaire, the first LEED Gold-certified housing tower in the United States. A second, equally “green” tower called the Verdisian was financed by Liberty Bonds several years later, with the same developer and architect (Cesar Pelli Associates were co-designers for both), both towers have high quality architectural finishes and a commitment to the conserver lifestyle nowhere to be found in the forest of Vancouver towers. There is no doubt that the Liberty Bonds primed the pump for Lower Manhattan housing development when it was most needed. A project like the Solaire was completed when it might have been left fallow, and the Battery Park neighborhood is the better for it. As housing decline shifted through 2004 and 2005 to housing boom, then housing bubble, it is less apparent that later projects such as the Rockrose Corporation’s high end, ultra-high-density 2 Gold Street tower would not have proceeded, had it not been for Liberty Bonds. Although it could not have been foreseen three years ago, the net effect of Liberty Bonds for the last few projects okayed (in spring of 2005) is to increase profit to developers, with modest public amenity in the form of a truly nominal number of lower-cost apartments for median or better income Manhattanites. The urban design strategies used to foster socially mixed high density housing in Lower Manhattan and Vancouver are sufficiently unique to their particularities in time and space to limit their application to those cities without thriving cores and attractiveness to global investors and high skill/income new residents. Of wider interest is the bell-weather function these two cities provide. The most telling of these shared experiences is how housing (especially condominium apartments, with up to half now bought as speculative investments) is currently trumping traditional dedicated office functions in Manhattan and Vancouver’s downtown peninsula. 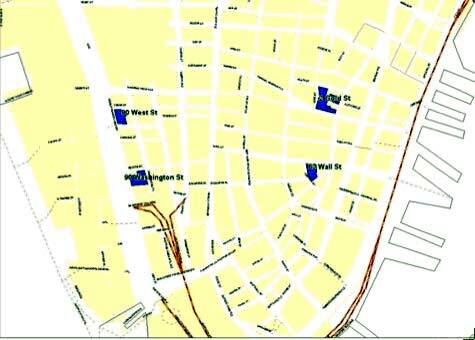 Nearly one third of the Lower Manhattan housing created through the Liberty Bonds consists of converted office towers. This is but part of a much bigger and alarming trend – the conversion of 8 million square feet of commercial space into housing in New York over the past few years. This is more square miles of offices than exists in total in all but a handful of American downtown cores. To this has to be added the conversion of a half dozen large Manhattan hotels into condos, the most prominent of these being the Plaza. If anything, the situation is more acute in Vancouver, which, unlike New York, is not a headquarters but a government and services town in terms of its office space needs. No new office tower has been proposed in years for downtown Vancouver, and with a growing queue of applications to convert existing towers to housing, city council has placed a temporary moratorium on further conversions, while the planning department completes a study on long term space needs. The riposte from the development industry in New York and Vancouver is that office space construction is cyclic, and when rental prices are right, a new wave of construction will begin. The Economist magazine has described the current housing boom as “the biggest speculative bubble in world history,” and the bursting of temporary bubbles can create long-term problems, such as the continuous annual decline of Japanese housing prices ever since their bubble burst in 1991. With the cancellation of federal social housing programs in Canada and the United States over the past two decades, it is now harder than ever to create social diversity in downtown neighborhoods attractive to moneyed migrants, as in New York and Vancouver. Vancouver planners have almost ritually required developers to give over portions of their sites for social housing, but without federal funding programs to build the actual buildings, they are selling the land and building instead in the cheaper but poverty-stressed Downtown Eastside, much as the NYCHDC does. Lower Manhattan and Vancouver’s downtown peninsula share a problem that most North American cities would love to have – too much interest in new downtown housing. It is important to look beyond the current housing bubble to ask whether the wholesale exchange of offices for condos is in the long-term interests of the economic health, even the urbanity and livability of these two cities. For example, projections of ridership for Vancouver’s latest rapid transit expansion predict more people leaving downtown for the suburbs to work each morning than coming into the center, leading to current calls by politicians on the right for Seattle-style suburb-to-suburb freeways. This is hardly the balanced urbanism Vancouver planners would have us believe they have shaped, and it is nonetheless a direct consequence of the ham-handed downtown re-zonings of 1991. Vancouver and New York City must now plan with more subtlety and imagination, less they trade their metropolitan status for new roles as pleasure zones for the nomadic planetary rich – or just as bad – downtown Sun Cities for aging Baby Boomers who seek a taste of urbanity in their new condos after lives spent in the suburbs. Currently the architecture critic for The Vancouver Sun, Trevor Boddy has taught architectural and urban design, history, and theory at the Universities of British Columbia, Oregon, Manitoba, and Toronto, and lectures globally on contemporary design and cities. He has worked as an urban designer for planning departments in Calgary and Edmonton, and consults on urban spaces, historic preservation and architect selection processes across Canada, the United States, and Hong Kong. Boddy’s independent critical monograph The Architecture of Douglas Cardinal, was named “Alberta Book of the Year” and short-listed for the International Union of Architects/CICA prize for best book of architectural criticism published worldwide. His essay, “Underground and Overhead: Building the Analogous City,” was included in the collection Variations on a Theme Park: The New American City and the End of Public Space, named “One of the most important books of 1992" by the Voice Literary Supplement. His architectural criticism has earned the Western Magazine Award for arts writing, and he was named co-winner of the 2003 Jack Webster Journalism Award for civic reporting. He welcomes comments at trevboddy@hotmail.com. -- New York City Housing Development Corporation: c/o Tracy Paurowsky, Director of Public Information tracypaurowski@nychdc.org. -- NEW YORKERS: George Aridas/Albanese Organization, Michael Sorkin, Ann Ferebee, Jeff Wayne, Tracy Paurowski/NYCHDC, Michael Bell/AIA-NY. -- VANCOUVERITES: Larry Beasley, Michael Gordon, Karis Hiebert and Paul Gedye in the City of Vancouver Planning Department, Ian Gillespie/Westbank Projects, Bob Rennie/Rennie Marketing Systems, Joyce Drohan/James Cheng Architects, Bing Thom/BTA Group, Herb Auerbach. 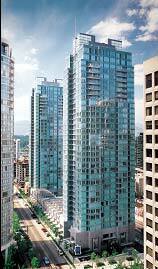 INSIGHT: Downtown Vancouver's Last Resort: How Did "Living First" Become "Condos Only?"